With two quick knocks on the sleek mirrored glass panel, see inside the quick and easy access compartment for your favourite snacks and beverages without opening the door, reducing cold air loss to help keep food fresher longer. The freezer drawers slide forward when the door is opened for easier access. Designed with a contemporary flat door fascia. Keep your fridge looking it’s best with the anti fingerprint textured stainless steel finish. Maintain more even temperature in your fridge with cold air automatically released from front and rear ducts. The front air ducts are great for cooling items at the front of the fridge and helps keep food fresher for longer. The LG SG5I700TSL Refrigerator was added to the Refrigerators category in October 2017. 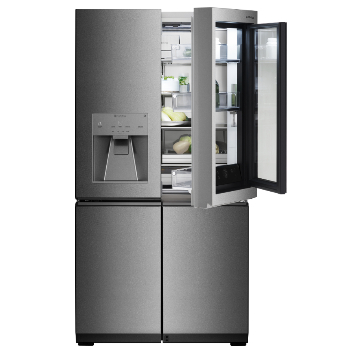 The lowest price GetPrice has found for the LG SG5I700TSL Refrigerator in Australia is $9,499.00 from David Jones . Other merchants who stock it are David Jones .